Does this mean an ad will cost $40 million dollars per spot? So, I was just on Facebook – along with 800+ million of my friends (soon to be be 7.3 billion) – and couldn’t help notice the sidebar banner ad pitch to “Advertise On Facebook” (see left). 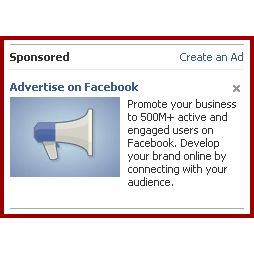 Now, I’ve never noticed an ad on Facebook. Not one. And I don’t think I’m alone. 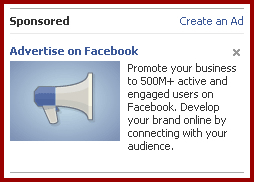 So why would I pay anything to advertise on Facebook? Because you can’t afford NOT to have your product or brand in front of 800 MILLION POTENTIAL CUSTOMERS. Right? Because fear works when you’re pitching your platform to advertising agencies – “You need us more than we need you.” So it’s better to make an expensive ad buy on Facebook, even though no one will see your ad, than to be left behind. Do they think we’re idiots? At least on television, even if the ad is being skipped in fast motion, you see the product. On Facebook, you don’t even notice the ad and, if you did, you wouldn’t care because you don’t want to see advertising when you’re on Facebook. Let I said before, Facebook, unless they start to charge user fees or do those horribly annoying ads that pop right in your face when you log in, is on the road to becoming worthless. The only time I’ve ever noticed an ad on Facebook was when a spam bomber took over my page with Harry Potter ads. it wasn’t just facebook – the ads followed me everywhere. Because we think we own the page we set up on Facebook and we don’t. We don’t even own the photos that we upload. READ THE FINE PRINT OF THE USER AGREEMENT. Facebook owns your family photos! Seriously. I would imagine from volume alone they bring in quite a bit. Even without any clicks – but impressions they probably get in the billions. Which even at a low CPM – equals… billions. They will be fine. I don’t, however, think this is a good option for advertisers because no one wants to see advertising as they are trying to send pictures and talk to friends about a family vacation. Do you want more Facebook followers or fans or are you more interested in boosting traffic to a website? Have you studied where your traffic is coming from?